With its own pneumatic lifting arm, the low-profile AutoLift HE floor scale takes efficiency and safety further by providing hands-free access for washdown demands. 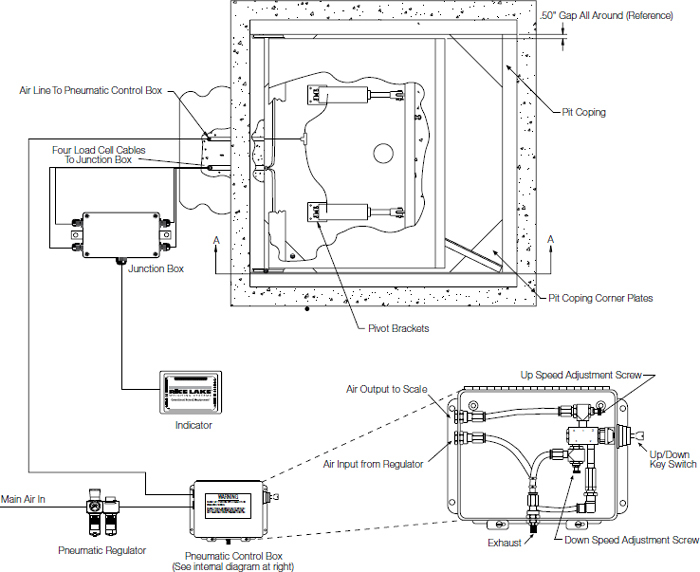 The remote TuffSeal™ JB4SS stainless steel NEMA Type 4X junction box can be remotely mounted up to ten feet from the scale, keeping sensitive electronics far from damaging chemicals and moisture. TuffSeal® Junction Box Protects Circuitry - Included with all models, the rugged, stainless steel TuffSeal junction box is specifically designed with a unique closure to prevent moisture ingress and protect sensitive circuitry. 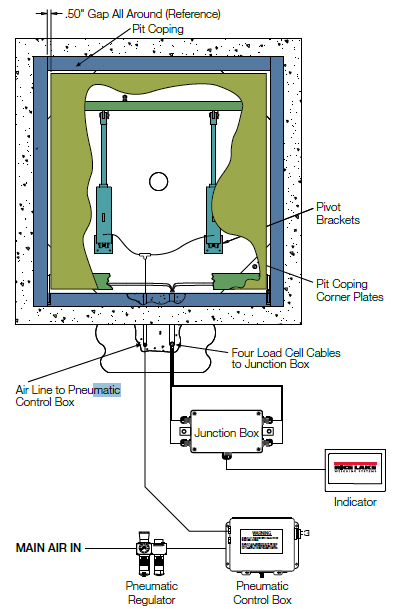 A Gore™ breather vent helps equalize pressure inside the enclosure that can be caused by sudden temperature or environmental changes. Rugged enough for excellent performance in harsh, corrosive environments, the Autolift HE design includes four IP67 welded seal load cells to maintain remarkable accuracy and durability. Its TuffSeal JB4SS stainless steel NEMA Type 4X junction box is UL approved for watertight protection and corrosion resistance. 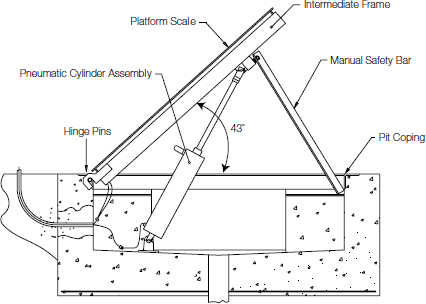 Powerful, pneumatic lifting arms promote efficiency and safety by permitting automatic hands-free access to the scale’s undersurface for complete sanitation throughout the cavity. With automatic lifting arms and manually placed safety bars, the scale’s pit cavity is exposed securely for the duration of cleaning, minimizing hand contact with caustic industrial chemicals. Because of the AutoLift HE’s 304 stainless steel surface top and underside, it is ideal for extreme industry sanitation practices. Available in a variety of sizes and load capacities from 2,000 to 10,000 pounds, the Autolift HE floor scale is the perfect solution for a wide range of washdown applications and facility sizes. SUREFOOT ™ for Accuracy - SUREFOOT decreases extraneous forces on the load cell, resulting in superior accuracy and repeatability. A stainless steel cup sits on the sub-frame and bonds a pliable neoprene cushion to a stainless steel top plate with attached threaded stem, allowing the stem and top plate to move laterally and tilt independently of the bottom stainless steel cup. 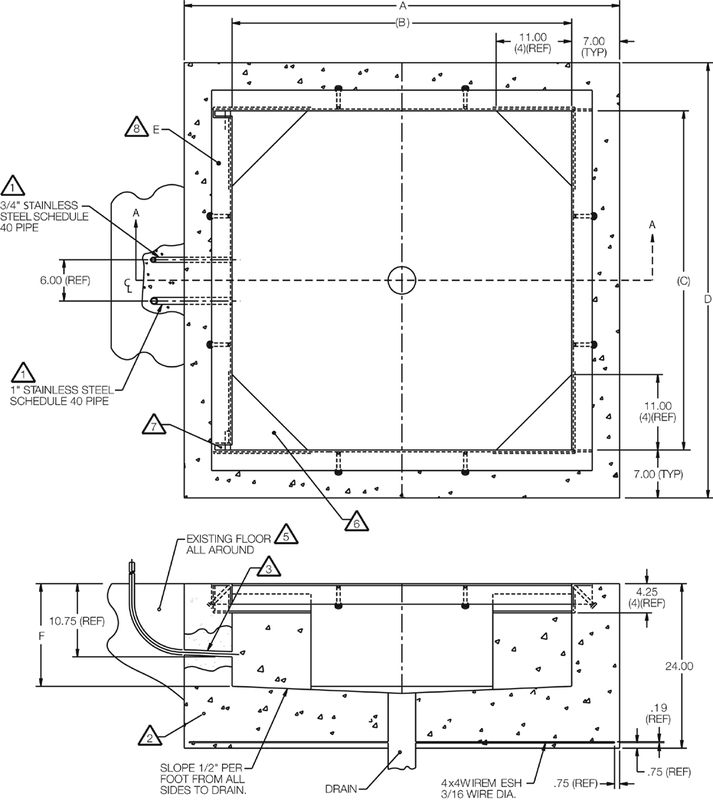 Superior Structural Design - The AutoLift HE floor scale is a part of Rice Lakes line of RoughDeck® floor scales. RoughDeck floor scales are renowned for their durability and superior structural design, which is why the AutoLift HE floor scale carries a full five-year warranty on the deck structure. 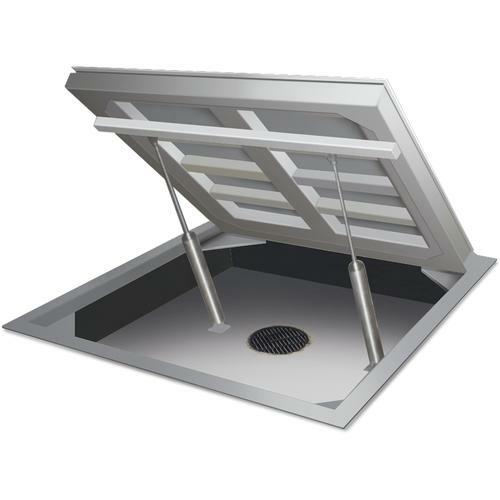 Efficiency from the Ground Up - The Autolift HE floor scale features a pit mount design for a flush, floor-level weighing platform that is easy to load and unload. The junction box can be remotely mounted up to 10 feet from the scale, further isolating electronics from the damaging effects of cleaning the scale.